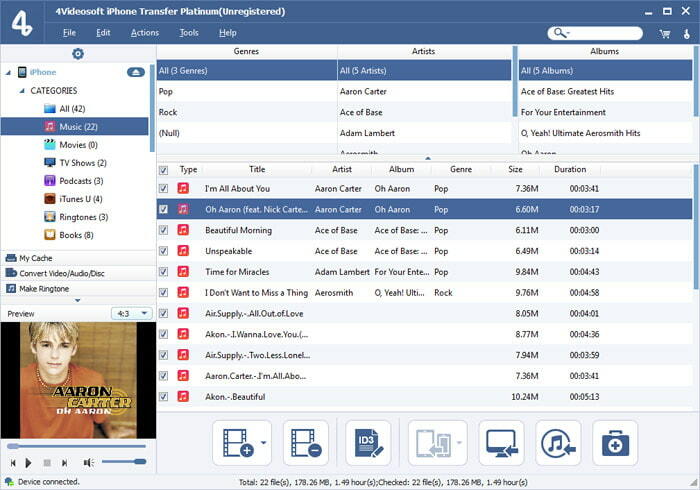 4Videosoft iPhone Transfer Platinum is the most wonderful iPhone manager, which has the capability to help users transfer your music, movie, e-books, ringtones, and photos and more items between computer and iPhone. In addition, you can also back up iPhone SMS and Contacts to your PC for safety. Now, it highly supports iOS 8 and the latest iPhone 6s/6s Plus/6/6 Plus, iPhone 5S, iPhone 5C, iPhone 5, iPad air, iPad mini, iPod touch, etc. It has highly compatible with the latest iPhone 6s/6s Plus/6/6 Plus, iPhone 5s/5c, iPad Air/2, iPad mini/2/3, iPod and the newest iOS 9, iTunes 12.3.